This month, independent perfumery Sonoma Scent Studio releases a new fragrance named Yin and Ylang, whose concept and inspiration were provided by Michelyn Camen of CaFleureBon. Yin and Ylang features "beautiful floral notes that meld into a woodsy drydown": bergamot, blood orange, soft aldehydes, beeswax absolute, ylang complete oil, jasmine sambac absolute, tuberose absolute, rose damascones, ginger CO2, Mysore sandalwood oil, oakmoss absolute, amber, patchouli, vanilla and musk. I was intrigued by Yin and Ylang's description and notes when they were first announced, because I happen to love ylang ylang and I've enjoyed many of Sonoma Scent Studio perfumer Laurie Erickson's previous floral fragrances. (Plus, what a fun name for a perfume!) You can read more about the specific ingredients, many of which are botanical or somewhat rare, on the Sonoma Scent Studio website, and more about the concept development on CaFleureBon. Ylang ylang is the star of this show, as promised, but it's supported by a lovely chorus line of citrus, floral, spice and wood notes. The fragrance's opening, for example, is an exuberant cluster of bergamot. It dissolves very easily into the ylang ylang, and I really do like the ylang that's used here, and the way its creamy and honeyed aspects are brought out by other supporting ingredients. The base has a hint of spiciness from the ginger, and some vintage-y (and almost-chypre) warmth from the sandalwood and oakmoss. I don't notice the patchouli, although I think I can detect a very subtle leather note. I'm trying to think of other ylang ylang fragrances that I enjoy, but the list is short — for some reason, this floral isn't often the headliner in a perfume. Years ago, I owned a bottle of Estee Lauder Private Collection Amber Ylang Ylang, but I eventually gave it away — it was somehow simultaneously too perfume-y and too flat for me. I recently re-tried Eau Moheli in a Diptyque shop, but I didn't get much ylang from it at all. I like the weirder side of ylang ylang as featured in Lush's Cocktail, but if I'm craving a lusher, more feminine take on the flower, I try to sniff it out in the heart of Chanel No. 5 Eau de Parfum. And I still wonder what ever happened to the bottle of i Coloniali Javanese Cananga that I owned more than a decade ago. All of this is to say that Sonoma Scent Studio's interpretation of ylang ylang is one of my favorites yet, because it skillfully showcases certain sides of the flower's personality — the bright and lactonic aspects that I happen to like best! — by boosting or sustaining the ylang ylang with carefully chosen secondary notes. (Even the jasmine and tuberose are graciously subdued here, as if they were finally agreeing to play smaller roles and allow their lesser-known companion to enjoy a moment in the spotlight.) My one regret is that while Yin and Ylang smells like a natural fragrance, it also wears like a natural fragrance — meaning that it has mild staying power. * No matter; I'll enjoy re-applying, especially since this seems like an easy choice for a spring/summer fragrance. I don't know much about the Eastern philosophy behind the yin-yang concept, but I can appreciate a poetic and harmonious olfactory composition when I smell one. Do you have any favorite ylang ylang perfumes, or any favorite florals from Sonoma Scent Studio that you'd like to recommend? Feel free to share in the comments! Sonoma Scent Studio Yin and Ylang Eau de Parfum is available as 34 ml ($100) and 17 ml ($55) bottles and as a 5 ml travel spray ($21); samples are also available. 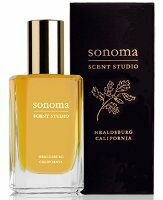 For buying information, see the listing for Sonoma Scent Studio under Perfume Houses. * Ed. note: It is not, however, a 100% natural fragrance. 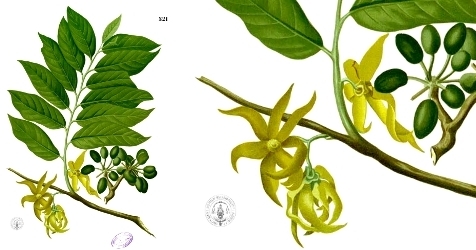 Note: top image is color plate of Cananga Odorata from Flora de Filipinas by Francisco Manuel Blanco, via Wikimedia Commons. I received my travel spray yesterday, and wore this to bed last night. I love it, and may have to get a larger bottle….I can still catch traces of what was a very light application 12 hours later. I haven’t yet received my sample of Yin and Ylang, but I am very much looking forward to it! I like ylang- it’s a major player in Tom Ford Black Orchid Voile de Fleur (NOT the original, which I don’t like, but the discontinued EdT version). AG Songes seems to have a rich ylang effect too. (I notice that it’s been far too long since I wore No. 5. Must remedy soon. How close, would you say, is this one to Jour Ensoleille? That one is lovely and rich, as well, but right on the verge of too animalic for me. Mals86, you are right about the ylang in Annick Goutal Songes! I think Yin & Ylang is a little more citrus-woods than Songes, a little less floral — but anyone who likes Songes should try this one too. I really can’t wear animalic white florals, but to me, the jasmine and tuberose in Y&Y are quite silky and smooth, not animalic at all. Which makes me happy. As an aside, it’s not the florals in Jour Ensoleille that are animalic – I think there is honey in it, which can go pretty skanky on me. But Laurie’s florals sit on very rich, woody, deep bases. Nostalgie is another SSS floral with a beautifully deep base. Mals – I would say there are similarities to JE (one of my top 5 perfumes) but nowhere near the longevity. If you are a JE fan like me then you will probably prefer JE, which is hard to beat. And luckily I am in the US for a short while (nice to read NST in real time for a change!) and have got my back up bottle. Also wearing Nostalgie ATM and its beautiful. The postage restrictions on SSS make it hard for me to sample Laurie’s fragrances now but I’ll try to try this somehow. It sounds lovely. Thanks for the review. The ylang in Givenchy’s Ysatis is quite prominent to me; love it. Will be wearing it today. I also keep a little bottle of ylang perfume oil and dab it sometimes, and its nice in the bath too. I’ll get out my Chanel No 5 EDP for an ylang test. Love the vanilla in that one. Annemarie – I too am an Aussie who finds it hard to sample SSS. But I’m in Boston until 12 April and had my SSS pack waiting for me at my hotel thanks to Laurie, including a Y & Y sample. If you wanted to order a shipment to Boston I’d be happy to bring it back to Oz for you. I can email my details if you are keen. Thanks Cockatoo, that is most kind, but I have a number of other scent-related purchases on the go at the moment. I’m sure another opportunity will emerge at a later point. Safe travel home! Actually Laurie saw this thread and has very kindly thrown in a sample for you with my order so feel free to email me at gorely dot hodge at gmail dot com if you would like me to post it to you. I Love this one! Although I find the fragrance lasts all day even on my scent-eating skin. It does stay close to the skin after the first hour. In response to Mals’ comparison question, I find very little signs of animalics in Y&Y. It is smoother and more about the florals whereas JE incorporates more aspects of the outdoors elements, like warmed dry grass in the afternoon , so I tend to like wearing it in August and September. Y&Y is a more gentle feminine scent. Thank you! I am anxiously awaiting my sample. I am looking forward to sampling this. Another ylang ylang I LOVE— but it is, in fairness (to me at least), more of a patchouli “softened” by ylang ylang, gardenia and sandalwood is Le labo’s Ylang 49, my only FB purchase so far this year. Any ylang lover needs to try Alahine. How is this compare to Michallef Ylang in Gold? Personally, I think this is one of Laurie’s most beautiful florals yet! And like some others have said, it wore all day on me. As far as recommending other SSS florals, this one isn’t really considered a floral, but I have really enjoyed the rose in Amber Noir this winter. So don’t overlook that one based on the name. It has a lovely rose heart. Thank you for a lovely review, Jessica. I am reading this thread with great interest, as I love Ylang Ylang and have been looking for a perfume where the YY is the prominent note, not just a bystander. I don’t like citrus notes, they don’t match with my chemistry. I’d love more suggestions of YY perfumes, and if possible of brands that are easily available or that ship WW (I live in Japan). Just tried my sample today, and it is lovely – really lovely. I received a free 1ml sample of Yin & Ylang with other purchase. I’m going back to buy more, I love it. Y&Y is related in structure to 1991 Givenchy Ysatis, just more subdued. It’s quite tenacious on my skin although projection after the first hour subsides. I don’t find it animalic. I also have Micallef Ylang and a decant of Annick Goutal Songes which is more jasmine focused IMO. The Micallef is like the smoothest colatura soprano; the top note is sustained and exquisite, counterpoised by faint bitter herbs below. Perris Monte Carlo Ylang Ylang Nosy Be is another I have tried,the most gender fluid. I want more of that too. Just received 230ml of Alahine. Looking forward to trying it. And will look out for Jour Ensoleille.